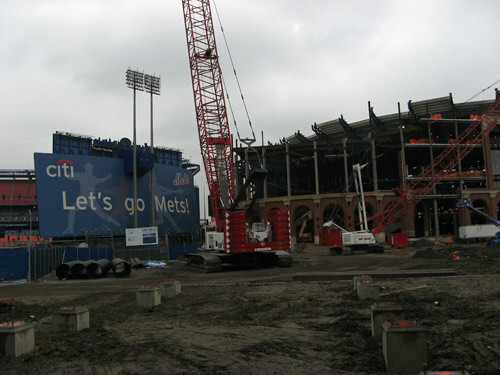 In honor of the final game at Shea Stadium — a look back at the game we attended on August 20, 2008. 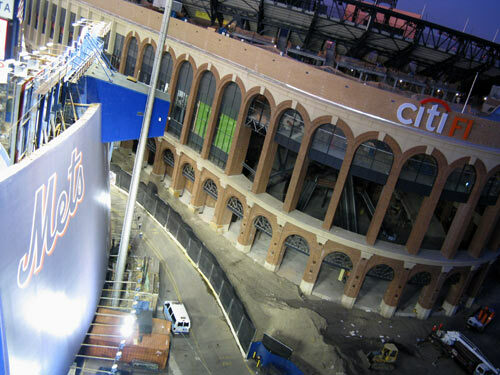 Alas, it will be a quiet post-season for the city’s baseball fans. 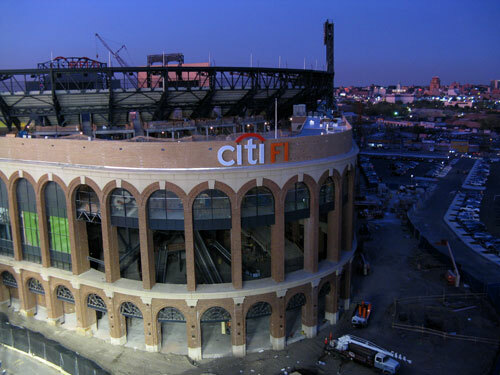 Last week, the Yankees bid farewell to their old stadium amid much fanfare; by contrast, the Mets final loss to the Marlins was marked by familiar frustration — yet another late season collapse and an ignominious end to a 44 year run at Shea. From up in the nosebleeds, we had a prime view of the Amazins’ future home, whose construction progress we’ve been watching all year. Soon this will all be reduced to a pile of blue rubble. 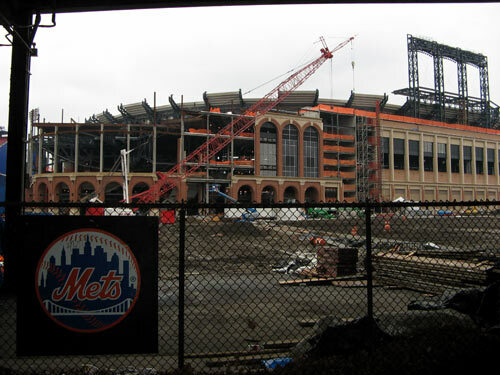 While Shea was hardly ever a paradise, it will be strange riding the 7 next year, and finding it paved over to put up a parking lot. 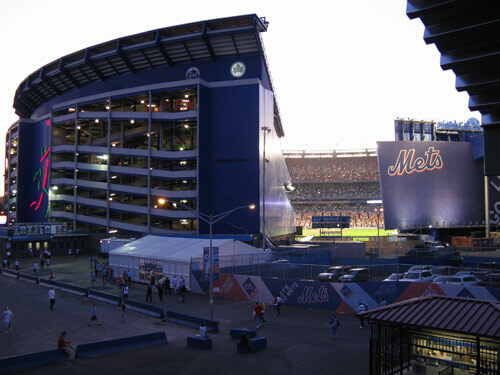 I’d promised myself at least one more trip out to Shea before the Mets move on to the nearly complete Citi Field next season, so when SYB offered up a last minute invitation to the watch the boys in blue, I was there. 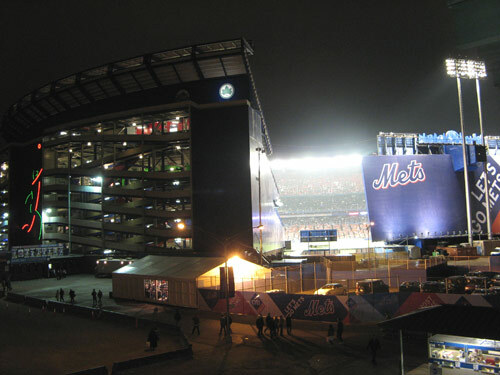 The weather during these early season games can be iffy, and I arrived at Willets Point on a chilly, damp night just in time for the Mets’ 6-run third inning. The thundering cheers, which I could hear from the subway platform, continued as I climbed my way up, up, up to the upper deck nosebleeds to meet my friends, JL and the brothers B. We huddled under the Mets fleece blanket as best we could as the cold and damp settled into our bones; at some point it actually began drizzling lightly, forcing us to move even farther back and up to seek shelter under the overhang. Not nearly enough precipitation to interrupt play, but enough to make us a little unhappy as we shivered in our seats. We (all of us except HYB) were determined, though, to stick it out at least until the 8th Inning Sing-A-Long. 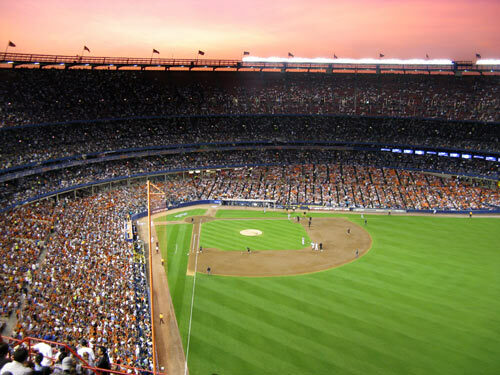 The week before, the Mets had asked fans to vote on the song which would be used for the Shea sing-a-long. Calls to write in Rick Astley’s “Never Gonna Give You Up” were circulated wildly, and when the voting concluded on April 7, the so-cheesy-it’s-awesome 80s dance song was the overwhelming winner with over 5 million votes. That’s the power of the Internets! Team officials, though, were having none of the Rickrolling. Citing some loophole language in the online contest rules that the final poll tally would only “help decide” the song to be used, they decided instead to pick a winner based upon in-stadium reaction during the first six home games. Inherently flawed methodology aside — applause-o-meter? adjustments for game attendance? — I take issue with the Mets deciding to undermine the results of the democratic voting method, and their subsequent qualifying of the massive write-in as an “Internet attack.” As a conciliatory gesture, Astley’s tune was the first of the songs to be auditioned. It was booed — heartily! 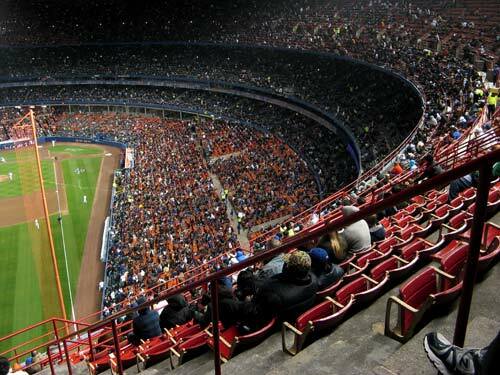 — making it highly unlikely that the song will ever be heard at Shea again. Ah well. 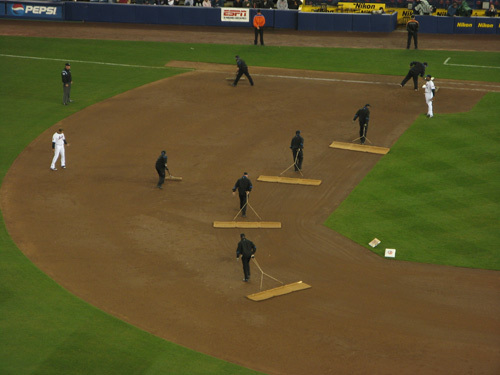 Eighth inning came around, and the first (and probably best) of the runoff songs started up: Bon Jovi’s “Livin’ on a Prayer.” Granted, it’s a lot more Dirty Jerz than New York, but would we rather have say, the theme song from “Friends”?! Good grief! We did our part, belting out the blue-collar plight of Tommy and Gina at the tops of our lungs. 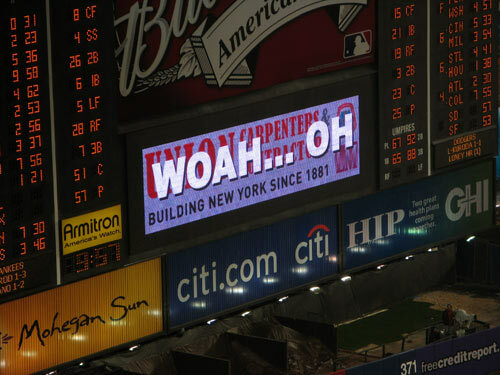 Um, I don’t think this is how “Whoa” is spelled… is it? 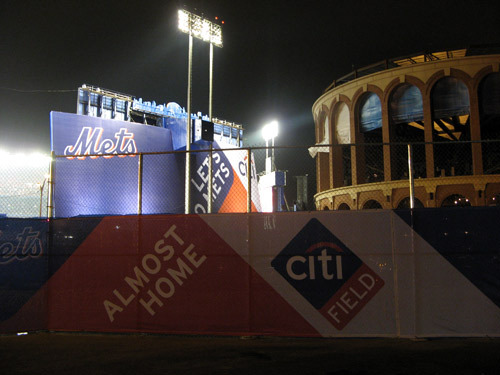 Oh, and the Amazins won, 8-2 — the first of what we hope will be many wins this swan song season at Shea. Check out the rest of the game flickr set here. incidentally, why isn’t Google commemorating Cinco de Mayo with a festive homepage logo? Is Dennis Hwang on vacation?